Far from Beijing and Shanghai, thousands of kilometers from the Middle Kingdom, masterpieces of Chinese art survive, change hands and move from collection to collection. In New York, London, Paris and Brussels, Western collectors - fascinated by an entirely different relationship to drawing, writing, form and colour - are keen to obtain historical works of Chinese art - sometimes thousands of years old. thierry Ehrmann : "Europeans and Americans are also interested in the great 20th century Chinese masters, especially those who managed to build bridges with Western culture... while lots of Contemporary Chinese artists (graduates of major art schools in the country) have managed to garner the support of some prestigious galleries in the United States and to seduce some of the Western world's most powerful collectors." Little by little, Chinese artworks are ending up back in their country of origin: Chinese collectors are today - logically - the largest purchasers of Chinese art. As a result, Westerners wishing to participate in this market are forced to follow the prices movements or step out of the ring. As the centre of gravity of the global Art Market shifts towards the East, a new price equilibrium is emerging. And Chinese artworks are the first to benefit. The paintings of several Chinese artists who settled in Europe during the first two thirds of the 20th century are particularly sought-after by Western buyers, especially since the 2008 financial crisis. In 2000, San Yu's (常 玉) Woman with arms raised (c. 1920-1930) was acquired for $1,200 at Piasa in Paris; it has just been sold for $170,000 at Sotheby's in the French capital. And this result is far from being an isolated case. The prices of works by Chu Teh Chun show overall growth comparable to that of San Yu's works: +2,000% since the beginning of the 21st century according to Artprice's price index calculations. Zao Wou-Ki's painting 23.05.64 was auctioned for the first time in 1991 by the auction house Briest in Paris for $78,000. In December 2000, an Asian collector acquired it at Camels (in Paris again) for $251,600. On 30 September 2018, the same piece fetched $11,547,240 at Sotheby's in Hong Kong! Via Hong Kong, the Chinese Art Market is managing to recover lots of masterpieces dispersed all over the world. Among the most recent, an imposing 4.35 metre long scroll featuring a painting by Su Shi 苏 轼, active in the 11th century, was sold for $59,206,800 at Poly last month. The scroll, which also contains four colophons by major Chinese intellectuals between the 11th and 17th centuries, was kept in a private Japanese collection after spending many years in Tokyo's Soraikan Collection. As Alex Chang, CEO of Hong Kong's Poly auction house, explained in Artprice's 2017 Contemporary Art Market Report: "I think there will eventually be a junction point between Oriental art and Western art. [...] However, I believe that as far as traditional Chinese art is concerned, Western collectors will probably continue to focus their interest primarily on objects and antiques, while Asian collectors will prefer Chinese calligraphy and painting." The major American galleries play a vital role in the dissemination of Contemporary Chinese art in the world. Not only by offering them exposure in their exhibition spaces located in the world's principal economic capitals, but also by their participation in the world's most prestigious Contemporary art fairs. In this context, the contribution of the Pace Gallery (which has branches in New York, London, Beijing, Hong Kong, Palo Alto, Seoul and Geneva) has allowed more or less the entire Western world to discover a whole wave of Contemporary artists Chinese. Of the 12 currently represented by the Pace Gallery, six were graduates from the famous Capital Academy of Fine Art in Beijing between the late 1980s and early 2000s (Qia Xiaofei). This school has been an incredible breeding ground for new Chinese artistic creation. But the country's most famous Contemporary painters were not all graduates from this Academy. 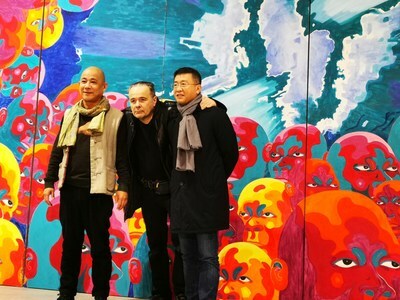 Zhang Xiaogang and Yue Minjun - both represented by the Pace Gallery and among the most popular Chinese oil painters for Western collectors - received artistic training at the Sichuan Fine Arts Institute and the Hebei Normal University respectively. "Artron Art Group (Artron), a comprehensive cultural industrial group founded in 1993 by Wan jie, is committed to inheriting, enhancing and spreading art value. Based on abundant art data, Artron provides art industry and art fans with professional service and experience of quality products by integrated application of IT, advanced digital science and innovative crafts and materials. Having produced more than 60,000 books and auction catalogues, Artron is the world's largest art book printer with a total print volume of 300 million a year. It has more than 3 million professional members in the arts sector and an average of 15 million daily visits, making it the world's leading art website."